We (and Fuse #8) have been complaining about the current dearth of new picture book editions of folktales. I mean, wouldn’t you love to see Mo Willems take on “The Three Billy Goats Gruff”? Bryan Collier do a “Hansel and Gretel”? An Erin Stead “Cinderella”? Hey, being a picture book casting agent is fun! 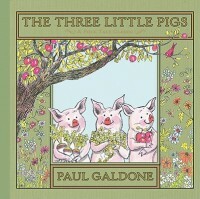 But in the meantime, have a look at Houghton Mifflin Harcourt’s reissues of Paul Galdone’s Three Little Kittens, The Three Bears, The Three Little Pigs, and The Little Red Hen. Originally published by Clarion in the 1970s and 80s, the four books (more will follow later in the year) are now available in a uniform paper-over-board edition at the nice price of $8.99 each. Galdone was a refreshingly modest illustrator: his retellings are straightforward and his unassumingly loose-lined, color-separated pictures (Lolly says) provide just enough embellishment, as when the lazy cat in Little Red Hen lolls on the couch, dreaming of a tin of sardines. And oh, the white space! Plenty of it on the page gives the stories all the room they need to do their stuff.